Often when I am going out birding I have in my mind what bird I would like to see on that day, mostly I fail. But not every day. The 7th August 1996 looked to be a fine summer's day and with an early tide at Ballycotton I headed there in hope of finding an orange billed tern. I was not going to be too fussy, Caspian or Elegant would be fine but Lesser Crested would be very acceptable. Lesser Crested Terns were regular in Britain in those years and was definitely on Irish birders minds as a bird to find. The plan was to go straight to the dunes above Allen's Pool with Casey my dog as there was usually terns roosting there at that time of year. Sure enough there were about forty Sandwich Terns but also a bird with an orange bill. The flock took to the air and I collapsed into the Marram Grass clutching at Casey hoping that they would return. They did. At first glance it looked good for Lesser Crested Tern. It was too small and the bill was the wrong colour for Caspian. Similarly I thought neither Crested or Elegant Tern fitted the bird in front of me. I took what notes I could but chronically aware of my inexperience I needed help. I slipped away and started running for my car, my legs barely supporting me. Fortunately Dennis O'Sullivan and Phil Davis were walking toward me from the car park watching me with some amusement as I stumbled toward them, expecting me to tell them about a possible Stilt Sandpiper that Phil had brief views of the previous day. I left the lads and continued on to the phone box in Shanagarry to get the news out. When I returned the bird had gone but Dennis and Phil were happy with my initial identification. 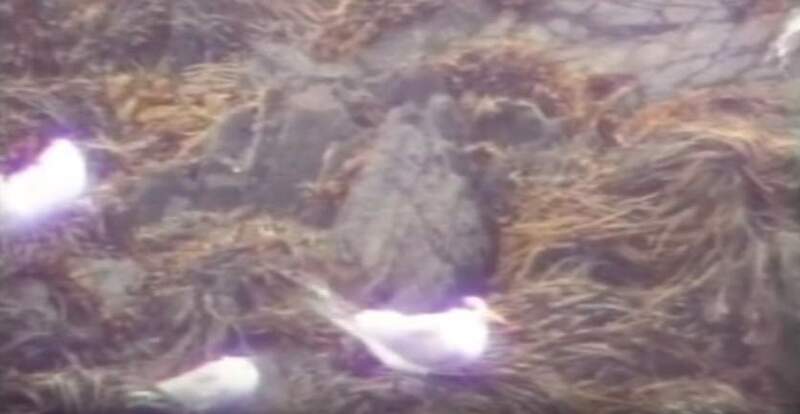 It was later located at the small island off Ballycotton pier giving good views and was seen intermittently for the remainder of the day and briefly the following morning. The bird was videoed by Paul Moore but I do not know of any photos of the bird. Size and structure: Sandwich Tern or slightly larger. When seen on the ground wings and body shape similar to Sandwich. Not seen properly in flight. Bill and head: Bill about the same length as Sandwich Tern but deeper based, slightly decurved mandible. Bright orange fading to a pale yellow tip. Noticeably different shaped bill due to depth and along with colour made it look more substantial. Forehead white/black moulting with black crown and crest. The crest was shorter and neater than Sandwich Tern. Body, wings and tail: Upperparts were a darker shade of grey than Sandwich Tern and the bird could be readily picked out by this when asleep. The rump and tail were a similar colour. Tertials grey with a white edging, not a strong contrast between them. Primaries pattern not properly seen, but at rest blackish edge contrasted with rest of upper parts. Legs: Black, noticeably thicker than Sandwich Tern. 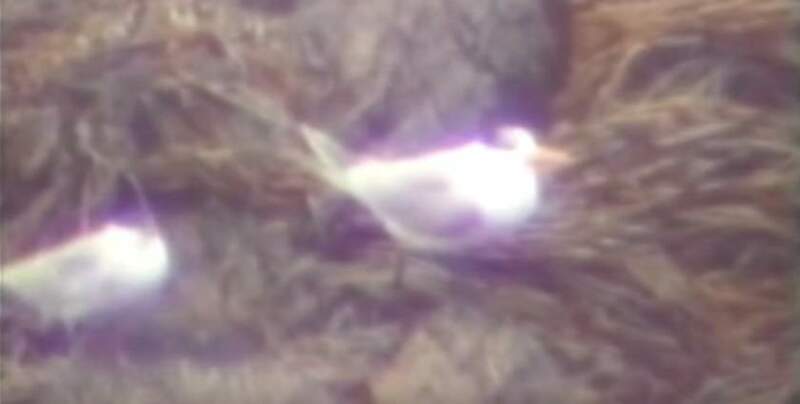 The bird was identified as Lesser Crested Tern rather than Elegant Tern because of a shorter deeper bill, shorter crest and grey rump and tail. From Royal Tern by smaller size, less substantial bill and grey rump and tail. Hybrids and backcrosses involving Elegant Tern and Sandwich Tern may be expected to have a white rump and paler grey upperparts when compared to Lesser Crested Tern. Potentially, some Lesser Crested x Sandwich Terns could lack black markings on the bill, but presumably the upperparts and/or rump would be at least paler than on pure Lesser Crested Tern. This was the first (Irish Birds 6(1): 81) and to 31st December 2015, only Irish record. The first British record was on 13th July 1982 at Anglesey, Wales (Hurford 1989) and there have been nine British records in total to date. 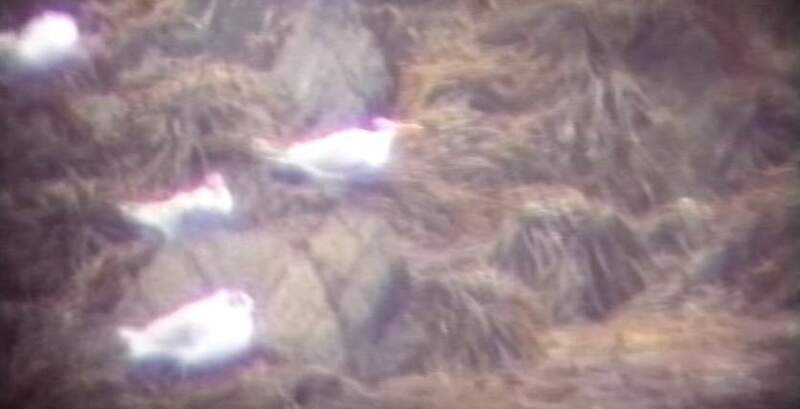 These included a long staying individual named 'Elsie' that frequented the Farne Islands, Northumberland each summer between 1984 and 1997. The most recent British record was in Norfolk and Suffolk in July 2005 (Fraser et al. 2007). 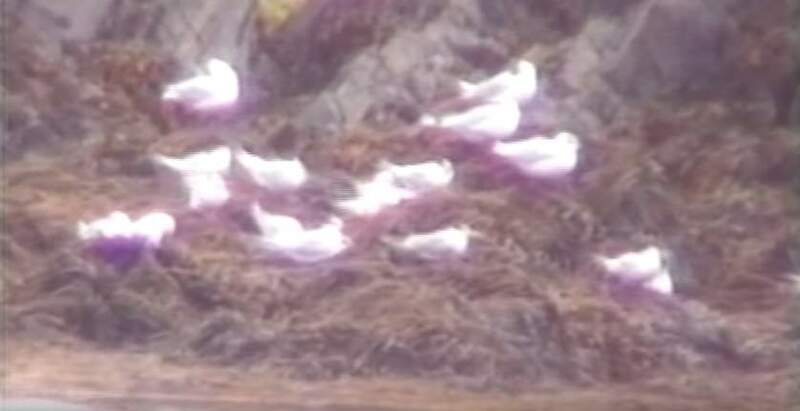 A selection of screen grabs taken from a video by Paul Moore while the bird had moved to a small island off Ballycotton in the company of Sandwich Terns and some gulls. Thanks to Paul Moore, Harry Hussey and Killian Mullarney for help in compiling this note. Fraser, P.A., Rogers, M.J. and the Rarities Committee 2007. Report on rare birds in Great Britain in 2005 Part 1: non-passerines. British Birds 100(1): 54. Hurford, C. 1989. Lesser Crested Tern: new to Britain and Ireland. British Birds 82(9): 396-398. Lesser Crested Tern is widespread from eastern Africa through the Indian Ocean to northern Australia. 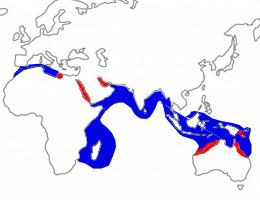 The nearest population breeds in Libya with most wintering off northwest and west African coasts. It is rarely found in Europe but birds have bred and in some instances have interbred with Sandwich Tern in Italy, France and England.